We just finished watching a great, quirky small independent film titled, Table 19. It has a great cast (Lisa Kudrow, Anna Kendrick, Craig Robinson, among others). Years ago in my 20's, 30's and 40's I relished indie films. And they were prolific compared to 2017. Most movies are made for young men. They have recently been the drivers for the billions of dollars generated by testosterone-geared movies. I was very happy to see that Wonder Woman which is from that genre, defeat and make huge amounts of money. I'm thrilled. But I doubt I'll watch the movie. 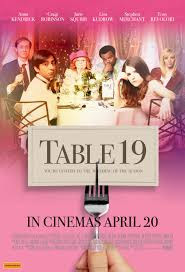 Table 19 is a film about a handful of odd characters who find themselves seated at the last table of a wedding dinner. They are individually eccentric, to say the least. I really enjoyed this film. I wish more indie films were made. I'm so old that maybe I'm just clueless. But I would recommend Table 19! If you don't like it then go watch the latest $300 M Mavil comic book which will premiered next Friday. Great cast. Good script. Good production values. And not about comic book characters. I doubt they even spent more than $20-$30M to make it. Sounds interesting. However, I never get around to seeing most interesting-sounding movies. Rick, I agree. I rarely watch movies anymore. I'm just not interested in seeing all the crap that's predominately made. We watched this film on cable On Demand. I understand not getting around to things. Thank you for commenting. Love your blogsite: http://sickoricko.blogspot.com/?zx=a31a81d25146d647!